I’ve been hearing about Jay Whaley’s rolling mill workshop for quite some time now. It seems that whenever the topic of rolling mills comes up, his name is in the next breath. So when I had a chance to take his workshop this past February…well, I jumped at the chance, even though it meant a 2 ½ hour drive to San Diego from LA! I guess you mean why I alloy my own metals. It is simpler for me, actually. With a wide selection of alloys I keep on hand, which are pretty inexpensive, really, and pure silver and gold, I am ready to create any color or carat of gold I want, in any amount at all. I can custom make my own “high-tech” sterling with alloys I buy that are far superior, in every way, to ordinary sterling silver. I make custom wire and sheet stock myself that I could never find in a catalog, and I make it faster than I could order it. It’s true! Why do you think most jewelers purchase their metal materials instead of making it? What is stopping most jewelers from taking this extra step do you think? Well, there are many reasons. 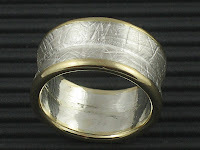 Many goldsmiths don’t understand just how easy it is to alloy your own metals. It seems so complicated, with those formulas and careful weighing, etc. It’s really easy with an alloy chart and an accurate scale. The quality of my “home-made” alloys is very high, and color and workability is excellent. I wouldn’t use it if it was problematic. Many jewelers feel that the time spent to hand-make their own stock is wasted time. Some forms take much longer than others, I would admit. I just can’t buy the stock I want from any catalog, and I refuse to pay the premiums commercially made metals cost, as well as waiting at the post office to pick it up!! Tell us how you first got started making jewelry. Who were you most influenced by and why did you pursue this path? I took my first art class my junior year in high school, after my mother’s suggestion. There, I learned how to lost wax cast, the year, 1968. 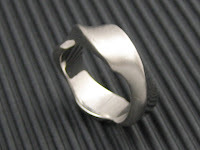 In that class, I cast a set of sterling wedding bands for my parents, and entered them in the Scholastic Art Show, a national juried art show for high school students. I won a National Semi-Finalist Award for my rings, and that was probably the event which propelled me into making (or teaching) jewelry-making for the rest of my life. So you could say that my mother was my first important influence! You are well-known now as a teacher. What particular satisfaction do you get from teaching jewelry making techniques? I have exhibited jewelry , drawings, and sculpture in galleries and juried shows through the years, but never found that particular satisfaction that showing others how to make something themselves gives me. After so many years of experimenting with jewelry forms and techniques, I feel I can create pretty much whatever I want, but experiencing the glow of accomplishment from someone who has completed an original piece of jewelry to their satisfaction, is quite profound to me. I love teaching. You are also making instructional videos. What about that appeals to you? You also invent jeweler's tools...tell us about this aspect of your work. What are your favorite self-designed tools? The first one, “Heetrix” was just a solution to a bench problem I had to resolve. I was working in a very small bench space in the lobby of the old Jeweler’s Exchange Bldg. in San Diego. My workbench was quite cramped, and my soldering had to be done where I did my fabrication work. Heetrix was the rotating soldering tray that swiveled out of my way when I wasn’t using it. I still use that soldering fixture almost every day in my studio. I pour all my own ingots, and used a pair of tongs and a melting dish for years. My students had real difficulties making ingot pours, until I bent some heavy stainless steel rod into my first ‘wire-handled ingot pourer” or WHIP, for short. Now that operation is really easy for me and all my students, and much safer, too. What do you think is the cleverest tool you've designed so far? Any sneak peeks of anything coming up soon? I have gotten pretty proficient at bending heavy stainless rod to create heat-proof clamping fixtures. One which is “on hold” for now is a “speed clamp” for the ingot mold, which doesn’t get hot, helps steady and direct the pouring process, but is going to be hard to manufacture, I know. Then again, I may be one of the only customers for such a tool… I do have a couple of really clever tools coming up, that I’m not ready to produce or market yet. I have been through a few different prototypes, and with one, it is just so trick… well, I need to get it into the marketplace! My prototype machinist gets calls from me every week to check on his progress. Jay also has “Wedding Workshops” where novice couples design and make their own wedding rings…under the close supervision of Jay’s expertise. Again, taking a couple who has never picked up a hand tool, and guiding them through all the steps needed to make rings for each other, that they actually make with their own hands, well, it’s magical. I have seen tears in couples’ eyes after their rings are finally finished. Not even close to the experience you get when you buy a ring out of a store. It’s wildly gratifying for me, in the strongest possible way. How would you describe your own style of jewelry? I have jokingly called myself a “jewelry whore”, because I do custom work of about any description. They tell me what they want, pay me for it, and I perform… My own designs are more mechanical, rather hard-edged, carefully finished. Unfortunately, with my schedule the way it is now, I really don’t have much time to make my own designs, or even custom work anymore. Actually, that is a good thing, as my hands are going out. Jewelers never discuss this aging problem, but it happens. My old hands are just wearing out from all the hard use over the years. I can still do the work, but the next day, my hands are really trashed, and hard to move. Just learn everything you can. Try everything, experiment with everything. Learn something from every “expert” you can, but don’t think “their way” is the only way,( including my own way). Making and selling jewelry is damned hard to do effectively, and honestly I don’t know what sage advice I could give someone trying to be successful at it. It’s also a bad economic climate now, which doesn’t help matters, either. Very interesting rings! So unique! I really like the third ring, does Whaley do custom designs? All this custom rings are beautifully made. Nice selection of alloys which are pretty expensive with pure gold and silver.